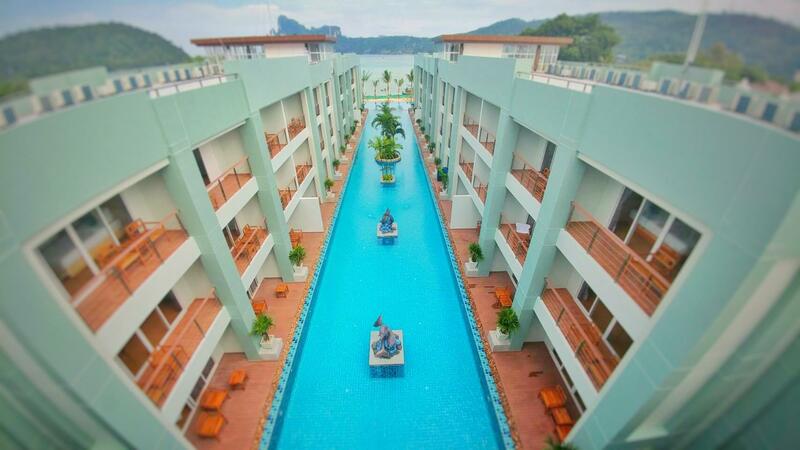 "The location of this hotel is amazing, we just walked from f..."
Have a question for Phi Phi Harbour View Hotel? "The room was clean and the pool was amazing." "The staff were very welcoming." Whether you're a tourist or traveling on business, Phi Phi Harbour View Hotel is a great choice for accommodation when visiting Koh Phi Phi. From here, guests can enjoy easy access to all that the lively city has to offer. With its convenient location, the hotel offers easy access to the city's must-see destinations. 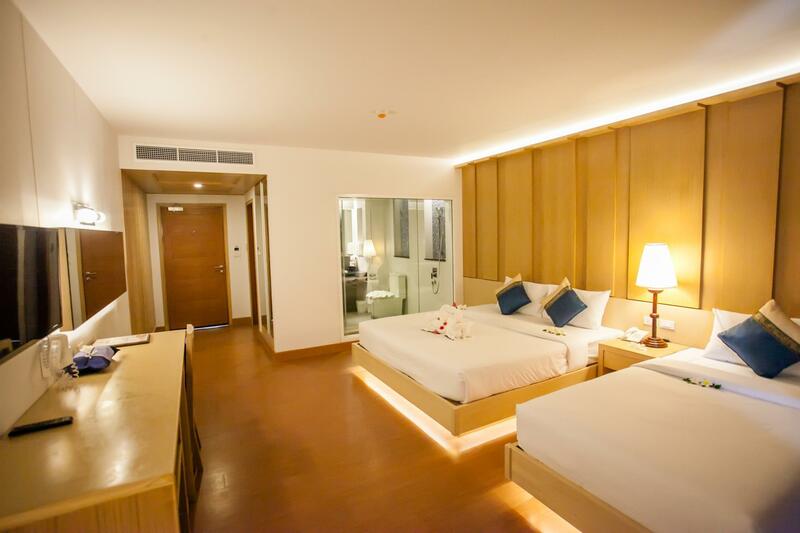 Take advantage of a wealth of unrivaled services and amenities at this Koh Phi Phi hotel. 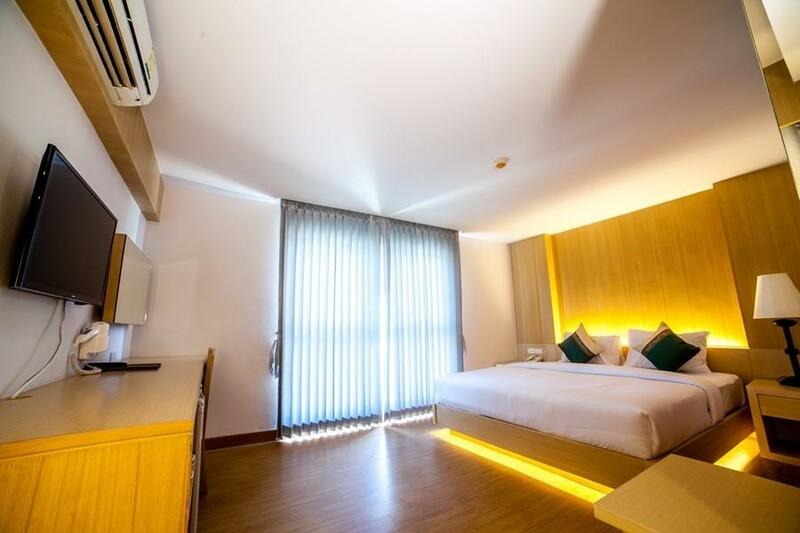 A selection of top-class facilities such as free Wi-Fi in all rooms, private check in/check out, daily housekeeping, 24-hour security, express check-in/check-out can be enjoyed at the hotel. Guests can choose from 80 rooms, all of which exude an atmosphere of total peace and harmony. The hotel offers wonderful recreational facilities such as watersports equipment rentals, boats, canoe, private beach, outdoor pool to make your stay truly unforgettable. 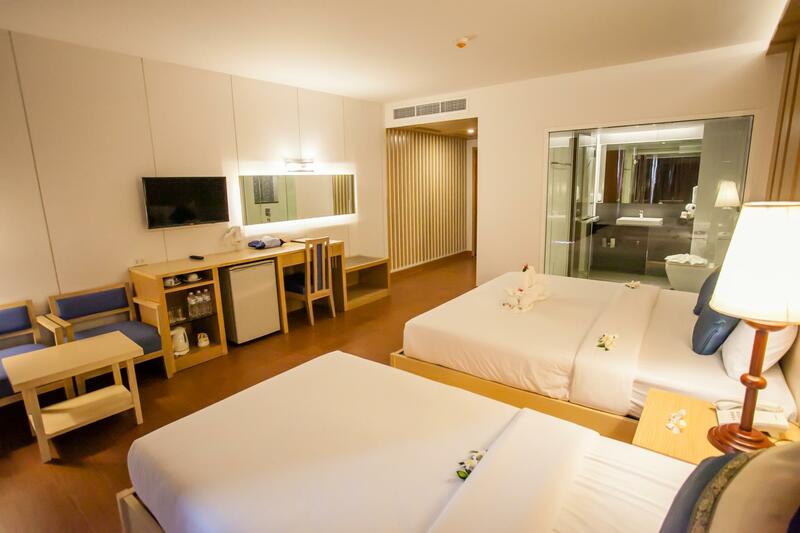 Enjoy unparalleled services and a truly prestigious address at the Phi Phi Harbour View Hotel. "The hotel is near the harbor and beach." Children under 3 years old stay for free with breakfast provided if using existing bedding. Children 4-12 years old will be charged THB 150 for breakfast per day. Great location, right next to the pier, quiet, and 3 minutes walk through the beach to all the night attractions. Great pool. Staff was nice. Cleanliness of the bathroom could improve, but wasn't terrible. Great value for money. Location is great! You have a short walk from the ferry to the hotel. The beach is interesting at low tide you walk out quite a ways. They are very strict with their rules however which is frustrating when on vacation trying to relax. Pool closes at 700pm /19:00 sharp! Breakfast finishes at 10:00am on the dot. Checkout is 11:00am or they charge 500baht per hour, Even if the room is not booked for later that day. The water in the shower and sink has a very strong sulfur smell. I would try another hotel if I return to this island. We absolutely loved this hotel! Great spacious rooms and the location is brilliant too. The staff were really friendly, only slight cons were rooms were a little dusty and you could hear some noise at night but we still slept well. As soon as we arrived we noticed that it wasn’t a 4 stars hotel, the infrastructure is old and the service was as it is a 1 star hotel. We didn’t feel welcome and every question was perceived as if we where bothering the staff. First room the hot water wasn’t working after few hours they changed us to a different one. The new room had a very bad smell every time that we where using the shower... we complain again but no answer, just waiting. Staff in the breakfast was very rude, but the options of food where good. We didn’t like the fact that when we wanted to use the beach, it was full of tourists that are not hotel guests and the beach area was dirty and poorly maintained. The room was big and the bed was ok, but again... this is not a 4 stars hotel, too overpriced for what you get in return. lovely pool setup, beach on one side, harbour and pier on opposite side, two minute walk from pier lots of food available close by thai,mcdonalds,pizza company etc. internet service very very poor-irritating very poor! the beautiful pool is disappointing in the fact that the crystal clear water is quite cold apparently kept clean by injecting cool fresh water every day few people swim over 1 time per day of 30 to 60 minutes. a shame as this pool is so beautiful beds are on the hard side, not very comfy. bathroom has really no place to hang towels. all rooms have nice patio overlooking or close to pool. The hotel is very close to the pier (400meters/2-3mins walk). 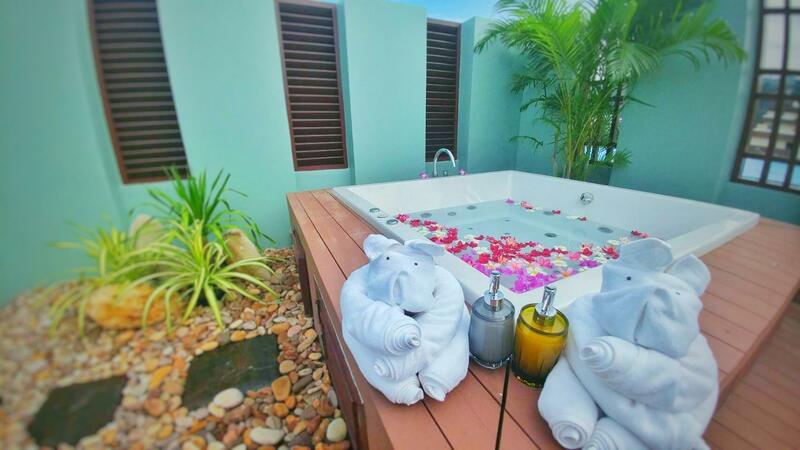 Its has a very nice pool and swimming up rooms to choose from. Its probably one of the best hotels in the island. Reception staff was very understanding and allow us to check out at 12:00 instead of 11 for no extra charge. Hotel is fairly small but also quiet considering is directly on the beach and so close to harbour. If you looking for quality accommodation for short time 2-4 days I would certainly recommend it. I haven't stayed at other hotels in the area so not sure how to compare. I heard the hotels in Phi Phi are generally not as nice as Chiang Mai and I found that to be the case. My room had direct pool access, which was nice but not worth it as it provided ZERO privacy - like 15 other rooms looked directly into the entirety of my room if the shades were not closed (and who wants to close the shades in Phi Phi?) The bed was SUPER hard so definitely not the most comfortable and the shower water tasted salty (and smelled bad for the first few minutes). But I saw the hostels in Phi Phi and they were 100x worse so generally, this place was not bad. Staff was polite, pool was nice, location was far enough from the noise but very walkable to the fun stuff, and the room was clean. A lot to pay for average, but again - I'm sure there are worse places around charging just as much. Thank you for your kind review, we hope you return to stay with us again on your next visit to phi phi island. The staff were very welcoming. The room was clean and the pool was amazing. Location could not be better! 10 minute walk to nightlife, right at the pier. Breakfast was good, the view was amazing. Only down side, they didn't come clean our room each day. I absolutely loved this hotel and location. It's right off the harbor so it's really convienet when taking the ferry in, or when doing day boat tours. It's close to the main strip of restaurants/bars, but not so close that you hear the noise. The pool is fantastic, right on the beach. There's a security guy by the beach entrance so you know your stuff feels safe. You can order drinks and food by the pool during the day. We got continental breakfast every morning which consisted of a chef making omelettes/eggs, as well as thai food, pastries, fruit, salad, and more. The staff was very friendly, although their English was not amazing. I would highly highly recommend this hotel. It was so great. The location of this hotel is amazing, we just walked from ferry ride from Ao Nang to our hotel in no time. The hotel is located on the beach. We enjoyed our stay at PhiPhi Harbour View Hotel. The hotel is centrally located but was away from the loud noise of party-goers! The room, bathroom, and common areas were clean. The beaches on both sides of the island were always crowded so it was nice to have the pool area—it was like our private oasis. Management should make a small investment and install privacy window film on their glass windows and doors. Currently, you can see through the doors and windows of the rooms across the pool from yours. This hotel is fairly new, modern and in a great location! You are close to everything but far enough away so you don’t have to listen to the music all night long. We loved our poolside rooms as we could get in and out of the pool from our room, and we enjoyed relaxing on the lounge chairs on our patio. The pool is right on the beach and has an amazing view. Would definitely return! Access straight on to beach. Close to Tonsai pier. Close to shops, bars& restaurants Beds rock hard. Breakfast @ Anchor Restaurant (next door) a little basic. A bit pricey compared to similar hotels in Thailand but paying for prime position. Overall the hotel worked just fine for us! The room was spacious and comfortable. The beds are a bit hard tho. The major negative was the WiFi. Even when it said it was connected in the room, it never worked. It did work in the lobby though. The is a new hotel on Phi Phi (I think it was built about 6 months ago). We stayed for 5 nights in a room with pool access and were overall satisfied with our stay. The location is super convenient -- very close to the pier and just down the beach from the "party beach", so you can easily get there if you want but it's far enough that you don't hear the noise. Something we found interesting was the design of the interior of the room. The shower is glass on either side, so when you are in the shower, you can be seen from inside the room -- and if the shade (to the sliding door for pool access) is open, you can be seen from the pool. You can also see through to the toilet. There is a blackout shade in the shower that you can pull down, but it didn't seem to be designed for inside a shower. The staff was ok -- not as welcoming and hospitable as I hoped. The pool closes at 7pm which we thought was a bit early, but it was nice and cool that we could access easily from our room! good location, big and clean room, near the beach. very poor breakfast, no gym, no spa, closing the pool at 19:00. the hotel is very expensive comparing to its facilities. worth half the price (we paid 5700 bht). Loved the pool here. It has everything, perfectly designed. Nice and deep, embedded jacuzzi, embedded kids pool and a jetted area under 2 inches of water perfect to cool down while tanning. Location is great, walk to beach 10meters and beach parties along north shore. Quick access to bar areas as well. Good security as well, as some ppl try to sneak in the pool during the day that aren't guests. Fantastic hotel on the beach. Great pool, large comfortable rooms with all amenities. Hotel restaurant is so-so but there are many good restaurants in town (i.e. within walking distance of the hotel).